Before EATING DIRT was published, and before I head out on the book-tour roadshow, I didn’t know much about American tree-planters. Research told me that the job was performed largely Mexican migrant workers who are in many cases an underpaid and invisible workforce. It was too big a topic for my humble account, but there’s this excellent investigative piece by The Sacramento Bee, which is the best treatment of the subject I have found. As I traveled through the Pacific Northwest, all these people showed up at my slideshows and presentations–in crowds I didn’t expect. They wore flannel shirts and vintage Gore-Tex. Many might describe themselves as retired hippies. They told me that they had planted trees in much the same way I had–camping out with their co-ed crews in deranged woodland gypsy camps–but that the industry as they’d known it (and built it in some cases) had largely died out. We were home based in Oregon, but worked all over the Pacific Northwest. 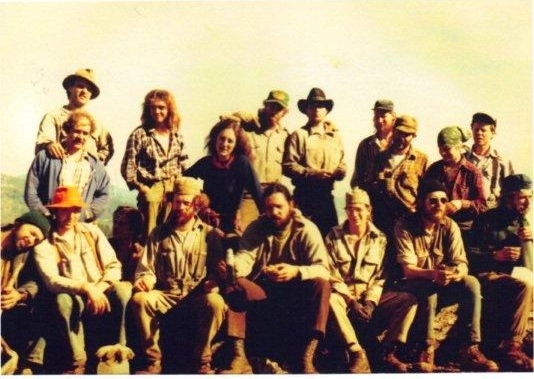 Our company began taking shape in the early/mid 70s when a few folks who were tired of getting four bucks an hour planting for BLM and The Forest Service decided to band together and bid on some jobs themselves. It started out as a cooperative, where we bid by the acre then paid ourselves by the number of trees each person planted. Tough, rocky, unplantable ground made each tree worth more, and easy, gravy, very plantable ground made each tree worth less. We had plenty of steep, rocky, slashy ground, but from your book and pictures I’ve seen, it is magnified considerably up north. 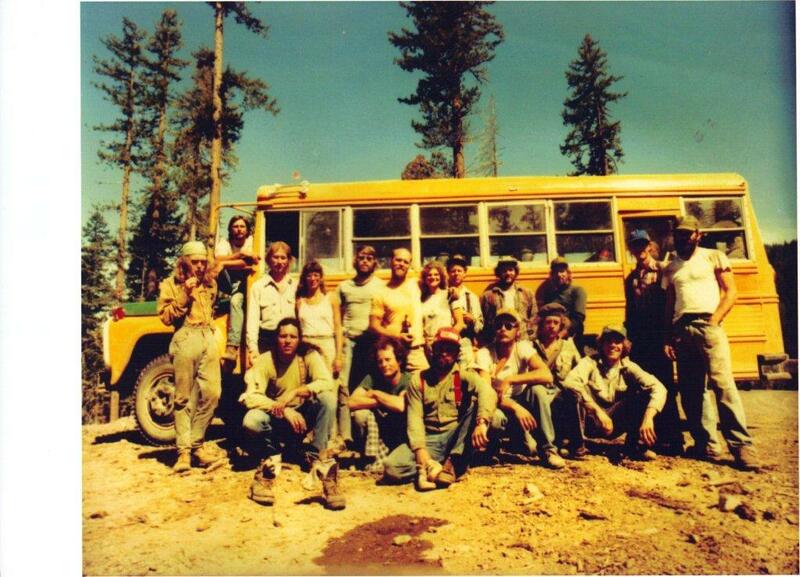 We generally camped in the area of our work, but often had an hour or longer drive from camp to the job site. Our number one form of transportation was a 20 passenger bus which we affectionately called “THE MOTHER SHIP.” We had a few vans and “six packs” for small jobs. Our camps consisted of teepees, churts, yurts, tents, and trailers of every size and shape. We grew to 25+ by 1980 and went from a cooperative to a corporation and began hiring employees. Like many who plant trees, most of us felt we were doing it “for the cause,” and despite the labor, loved what we were doing. Before we had an official name, we loosely went by Hockett’s Rockets, Hockett being the last name of one of our founders. We were officially Golden Reforestation, aka The Rockets. We competed for jobs with, and were friends with, crews with names like Home Grown, The Hoedads, Green Side Up to name a few. Sometimes we even worked together on big jobs or subbed jobs out to each other. We were co-ed and some of our hardest workers were women. You could insert our names in many parts of your book, but there are differences as well. We seldom planted by shovel. I disliked it when we did. Except for a few rare shovel or dibble jobs we planted almost exclusively by hoedad. An unwieldy tool for the novice. You guys were much more isolated, had larger areas to plant, more rugged ground, more threatening wildlife, worse weather, etc. The early years(1973-1980) were probably the most enjoyable, the most bonds made, life-long friendship began, relationships that turned into marriages and families began. The later years (1980-1988) the most profitable (none of us got rich), saw people moving on to “real professions” and the hiring of more employees. 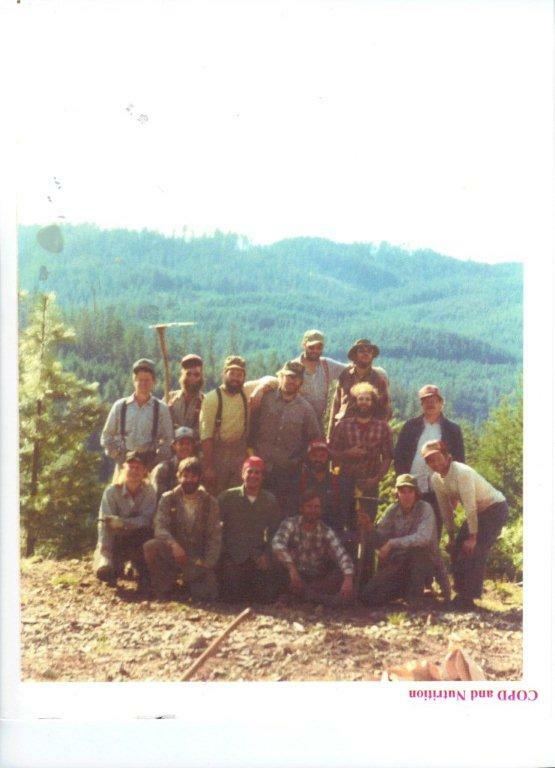 By 1988 we were down to seven owners, logging (thus tree planting), was dwindling, it was getting harder to compete with the companies hiring illegal cheap labor, and we were getting older. All of us had been planting for 15 years and some more. So we disbanded. Just like that. Fortunately, 25 years later, we still have a great circle of friendship. We have a yearly reunion(we call it a rendezvous) on Steamboat Creek, a tributary of The North Umpqua, at a spot we call The Riviera Club. We camped there often in our planting days, had a sweat lodge there, and lazed in the sun on those rare warm days. Some make it to the rendezvous every year, some every couple of years or so, and some only once or twice in the past 25 years. I’m fairly sure that all of the original 25+ have been at least once. They are spread around the world and in various professions. Some have retired. Two have passed on. Again, I enjoyed your book. It is being passed around The Rockets with instructions to feel free to make notations, draw pictures, etc., and I’m hoping it makes it’s way back to me. If it does, I was hoping I may send it to you to be signed, if that’s possible? Planting trees was a good thing. Good future luck. PEACE. Well, Larry, thanks for the awesome email, and send The Rockets my best. I look forward to the day that your copy makes its way to my mailbox. And can I just say? I think if you saw some of the new fibreglass, ergonomically designed shovels that the kids are using today, you might even become a convert.